I’m floating face down above the Great Barrier Reef, the world's largest coral reef, off the coast of Australia. Through my snorkel mask I see butterfly fish, brilliantly yellow with multi-colored stripes, skitter by. 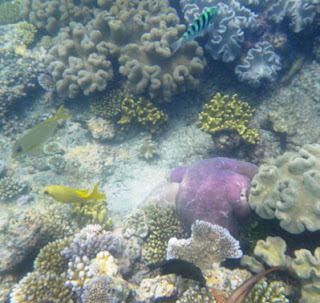 Bright blue parrot fish scrape algae from coral that comprises the reef. I stay clear of the surgeon fish’s sharp snout as I kick my way over the reef. 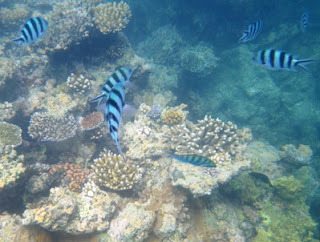 I don’t see large schools of fish, but several big blue fish, small ones withblack and white stripes, and large gray striped fishes catch my attention. Coral and fish gleam in bright colors at Great Barrier Reef. 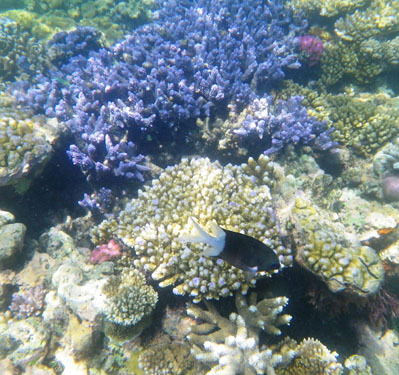 Anemone fish (the species of Disney’s Nemo) flutter their orange and white bodies in the sunny water; and a friendly hump-headed fish named Big Willy, who is familiar with snorkelers, eagerly approaches our guides to wait for handouts of food. I’m glad we don’t see predators such as reef sharks, which stay on the bottom and feed at night. The coral is spectacular. Hubby and I maneuver over a huge shelf with dozens of varieties, being careful not to stand on the coral as this destroys it (and can leave nasty cuts and scrapes). We see varieties in the shapes of artichokes, cauliflowers, flowers, mushrooms, stems, branches, boulders, and more. And the colors are astounding: blue, pink, yellow—as well as standard brown and gray. We’re on a tour out of Cairns (pronounced Cans) on the eastern coast of Australia. 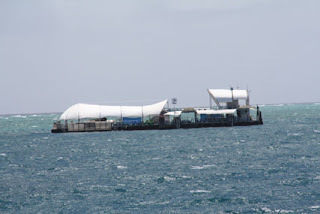 Early in the morning we boarded a 100-foot-long boat called Reef Magic to motor to Marine World, a platform in the ocean from which we can engage in several different activities at the reef. There’s indoor seating on the Reef Magic on two levels and outdoor seating, too, but it’s quite hot and humid, even at 8 a.m. Rain in the distance blows showers on deck, and winds up to 19 mph make the ride a bit bumpy. Waves wash over the outside seating, and we’re urged to stay seated during a rough patch. This floating platform is anchored in the middle of the ocean. 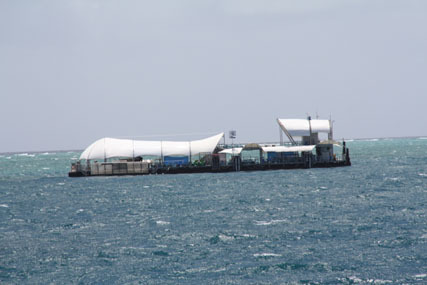 Once on the platform, which is anchored 31 miles out to sea on the outer reef wall, we can snorkel and view fish in a glass bottom boat or semi-submersible vessel during our five-hour stay. A generous buffet lunch and environmental management fees are also included in the tour price of $190. For additional fees, guests can participate in scuba diving, beginner dive, helmet dive, guided snorkeling, or take a helicopter ride to view the reef from above. Because we were there during jelly fish season, we decided to wear offered Lycra suits for protection from the cold and possible jelly fish stings (actually, we didn’t see any while snorkeling but did later from the boat). 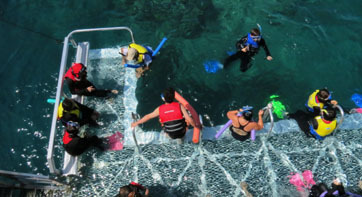 Snorkelers jump into the water from the platform. Muffins and cake are offered for morning tea, and later in the afternoon we snack on cheese, meat slices, dried fruit, crackers, and fresh watermelon and oranges. After cleaning up from our second half-hour snorkel session, hubby and I share a two-dip dish of macadamia caramel and strawberry ice cream. Sections of Great Barrier Reef spread out in the ocean (as seen from above). 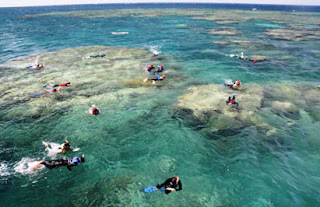 The Great Barrier Reef is enormous, so you just have to know where you are and appreciate the small slice of history and nature you’re viewing. After snorkeling we took pictures of multiple sections of the reef from upper decks of the boat. The boat ride back to the city, which took more than an hour, was sunny but windy. The tour provided a full day of interesting and fun activities—a not-to-be-missed event when visiting Cairns and Australia.